The recently released 2004 Bowman Heritage baseball, which features the 1955 Bowman design, includes 51 short printed cards in the base set. These short printed cards are seeded 1:3 packs (see list below). Additionally, there are 3 cards with variations that mimic errors that were made in the original 1955 set. The Black & White Parallels of these cards are NOT short printed. 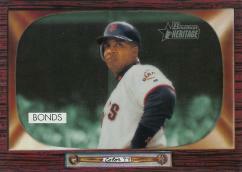 2004 Bowman Heritage carries a $3.00 SRP for each 8-card pack.